Duration of treatment and possible discontinuation should be personalized for patients based on their response to treatment, fracture risk, and comorbidities. The risk of osteoporotic fractures in geriatric patients is a major health care concern. The impact of a major fracture on patients' lives is often devastating. If one survives a major fracture, the transition to frailty and dependence is common. The costs to the individual, the family, and society are significant. Bisphosphonates, the most commonly prescribed class of agent for the treatment of osteoporosis, have proven efficacy for prevention and treatment of bone loss and fractures due to aging, estrogen deficiency, and glucocorticoid use. Recent concerns about potential long-term safety issues, such as atypical femoral fractures (AFFs), osteonecrosis of the jaw (ONJ), and esophageal cancer, along with the possibility that fracture risk reduction may persist for years after treatment is stopped, have resulted in interrupting or stopping bisphosphonate therapy. However, many questions surround optimal treatment duration, which patients may discontinue treatment, and what the retreatment criteria should be. From the outset, let me point out there is little evidence to guide us as clinicians. Nelson Watts, MD, an internationally recognized endocrinologist, refers to this as a "data-free zone." Expert opinion is based on limited data. This article attempts to put into perspective the long-term use of bisphosphonate therapy for the management of postmenopausal osteoporosis. The data available are for use of bisphosphonates in women; long-term use clinical trial data are not available for men. The currently FDA-approved bisphosphonate therapies to treat postmenopausal osteoporosis include alendronate, risedronate, ibandronate, and zoledronic acid. Bisphosphonates are available as oral formulations (alendronate, risedronate, and ibandronate) or as IV formulations (ibandronate and zoledronic acid). No head-to-head studies have been conducted to assess whether there are differences among drugs in fracture risk reduction or safety. The registration trials for bisphosphonates were three or four years in duration, with fractures assessed as the primary end point. The risk of vertebral, hip, and other nonvertebral fractures was reduced in women with osteoporosis. Alendronate, risedronate, and zoledronic acid trials were subsequently extended to investigate the long-term effects of these drugs. Ibandronate that assessed either oral or intravenous dosing regimens was not continued in placebo-controlled design. Fracture reduction is the goal of long-term osteoporosis treatment. However, the extension trials had smaller numbers of subjects and were not powered for fractures as a primary endpoint. Bone mineral density (BMD) was the primary outcome measure with fractures assessed as exploratory endpoints or collected as adverse events. The extension clinical trials demonstrated continued improvement of that BMD beyond three or four years of treatment and beneficial effects on fracture risk. No unexpected adverse events were identified in these longer-term studies of bisphosphonates in postmenopausal women. In studies of zoledronic acid use up to six years and alendronate use up to 10 years, continued treatment showed a reduction in both bone loss and vertebral fractures. The benefits of risedronate appear to be of shorter duration after discontinuation until BMD and bone turnover markers returned to baseline. There are no data for ibandronate. Alendronate has been studied longer than any other osteoporosis medicine in a controlled clinical trials setting. The original dose ranging study was continued for a total of 10 years with about 200 women. Treatment with 10 mg of alendronate daily resulted in a continued gradual increase in BMD to an average of 14%. Bone density at the hip remained stable. The total hip BMD maintained at about 7% above baseline, and the bone density at the femoral neck region maintained at more than 5% above baseline. Bone turnover markers remained in the premenopausal range. No safety or tolerability issues were observed with this length of treatment in this study population. The extensions of alendronate from the Fracture Intervention Trial (FIT) and zoledronic acid were of similar design. Only those subjects in the active drug arm were offered to continue. The subjects were rerandomized with one-half of the subjects assigned to placebo. This design also provides data for what occurs after taking a bisphosphonate for three to five years and then stopping. The original participants in FIT who were taking study drug alendronate during the study were recruited to continue in a five-year extension of the study, called FLEX.1 A total of 1,099 women were reassigned by chance into three groups: placebo, alendronate 5 mg, or alendronate 10 mg. By the end of the study, those women taking 5 mg or 10 mg daily had used alendronate for a total of 10 years. The study was designed primarily to examine BMD changes. Because of the smaller group size, fractures were collected as adverse events. Those who had switched to the placebo lost all or nearly all of the total hip and femoral neck BMD gained over the first five years. The two groups of subjects who continued to receive alendronate showed stable bone density at the hip sites. At the lumbar spine, those on alendronate gained more than 5% BMD, and BMD was maintained with a small increase in the placebo group with an average difference between groups of almost 4%. Bone turnover markers showed that those continuing alendronate maintained stable lower levels of bone turnover. Those who were no longer taking alendronate showed a gradual rise in markers over five years. Their marker levels ended up close to the baseline measured 10 years earlier. This correlated with a slow decline in BMD after stopping alendronate. The BMD and bone marker changes showed some residual effect for at least five years after subjects had ended a five-year course of therapy. Subjects who still had low femoral neck BMD (T-score ≤ -2.5) after five years of treatment were at increased risk of vertebral fractures, while those with femoral neck BMD T-scores above -2 were not at increased risk of nonvertebral fractures. The authors concluded that if BMD at the femoral neck region is above -2 and there are no prevalent vertebral fractures, the patient is at lower risk of fracture, and alendronate may be discontinued. If the patient has not achieved a bone density at the femoral neck of -2.5 or higher after five years, she may benefit from an additional five years of therapy. The gray zone is for women in the -2 to -2.5 range of BMD at the femoral neck. Bone biologists have estimated that about 75 mg of alendronate is retained in the skeleton after 10 years of therapy with 10 mg a day or 70 mg a week dosing.3 Upon stopping treatment, the release of alendronate from remodeling is estimated to be approximately the same as taking a daily dose of 2.5 mg. This results in the observed gradual upward trend in bone turnover rather than a rapid increase. Results from the second randomized extension of HORIZON-PFT were recently released online.5 A total of 190 women on zoledronic acid for six years in the first extension study were randomized to either zoledronic acid or placebo for an additional three years. Percentage change in total hip BMD was the primary endpoint with bone turnover markers and incidence of fractures as secondary endpoints. The effects of nine years of zoledronic acid showed small differences in total hip BMD mean change between groups from years six to nine. From baseline year zero to year nine, there were no significant differences in total hip BMD and femoral neck BMD between groups. The mean serum levels of bone turnover markers measured remained within the premenopausal reference range in both groups. Fractures were too few for comparison between groups. The authors conclude, "the results show continued efficacy in both the groups and do not provide convincing evidence of a benefit from continuing annual zoledronic acid infusions for more than six years." They go on to say, "The randomized data from 10 years of alendronate and more limited data for risedronate have been similarly reassuring in suggesting that long-term use will continue to maintain bone strength and sustained decreases in bone remodeling not associated with any increase in overall fracture risk." In addition, the results suggest the residual effect of discontinuing zoledronic acid after six years compared with three years provides a larger effect, supporting continuing use up to six years. Overall, the nine-year study suggests a diminishing return from its ongoing administration. A robust fracture benefit is observed for three years of use, a more modest benefit for six vs three years, and inconclusive benefits for nine vs six years of continued use. The authors recommend that almost all patients who receive zoledronic acid can probably stop and expect benefit for up to three additional years. This study is consistent with an analysis of one dose of Reclast that showed fracture-reduction benefit for about three years. Risedronate has been evaluated to seven years. In the first extension study of Vertebral Efficacy with Risedronate Therapy Multinational (VERT-MN), a total of 265 women continued their original randomization assignment for an additional two years. In years four and five of treatment, the risedronate group had a 59% reduction in radiographic vertebral fractures.6 The number of nonvertebral fractures was too small to show statistical significance. A further two years of only 164 subjects continued as an open-label study without a placebo group. One year after discontining risedronate treatment in subjects who had received two or seven years of risedronate therapy, the study indicated increases in bone turnover levels toward baseline and decreases in total hip BMD. As discontinuation of bisphosphonate therapy after three to five years is increasingly considered, there are no prospective studies to guide us regarding whether fracture efficacy is maintained during a break in treatment or a so-called "drug holiday." The Effectiveness of DiscontinuinG bisphosphonatEs (EDGE) study will determine whether and when patients can be withdrawn from alendronate without a significant increase in fracture risk. Investigators at the University of Alabama Birmingham are leading this study that will recruit 9,700 women over the age of 65 who have been taking alendronate for three or more years. Participants will be randomized to either continue or discontinue their alendronate and then will be followed over three years for clinical fractures and adverse events. In addition, methods to monitor fracture risk after discontinuation have not been established. The utility of basing treatment decisions on monitoring BMD and bone turnover markers has not been evaluated in prospective studies. Bauer and colleagues recently evaluated the FLEX study in a post hoc analysis to test methods of predicting fracture risk among women who have discontinued alendronate therapy after four to five years.7 After four to five years of alendronate therapy, older age and low hip BMD at discontinuation predicted clinical fractures during the subsequent five years. Follow-up measurements of dual-energy X-ray absorptiometry and bone turnover markers after discontinuation were not associated with fracture risk and were not recommended methods of assessment. Expert opinion provides some guidance based on studies covered in the earlier section, but it is important to note these recommendations have not been evaluated in prospective trials. The first step is to evaluate your patient's risk for fracture. The FRAX tool (www.shef.ac.uk/FRAX/) may be helpful in assessing the need for continued treatment or treatment withdrawal. Leslie and colleagues demonstrated that the FRAX tool can be used to predict fracture probability in women currently or previously treated for osteoporosis.8 Since the Bauer analysis showed that older patients and those with low hip BMD after five years of alendronate therapy remain at high risk of fracture, the FRAX calculator tool takes into account age and femoral neck BMD along with other factors in its risk assessment. If fracture risk is low after three to five years of bisphosphonate treatment and no fractures, stopping the medicine may be prudent. The "drug holiday" can be continued based on the estimated resolution of effect of the drug or significant lost of BMD or the patient sustains a fracture. If fracture risk is moderate after three to five years, treat for about five to six years, then offer a "drug holiday." The drug holiday can be continued based on the estimated resolution of effect of the drug or significant loss of BMD or if the patient has a fracture. If fracture risk is high after three to five years, continue bisphosphonate treatment for up to 10 years or change therapy to a nonbisphosphonate. If your high-risk patient has been on bisphosphonates for long term, consider a drug holiday of one to three years, or until there is significant loss of BMD or the patient has a fracture, whichever comes first. Although bisphosphonates are often considered as a class, the sustained effects of the drugs differ and need to be taken into account for individualizing clinical decisions. The resolution of effect for bone turnover markers was after five years for alendronate. New data for zolendronic acid demonstrate a sustained effect beyond that of alendronate since bone turnover markers did not change for three years after six years of therapy.5 Data for risedronate suggest a faster resolution or effect of one to two years. No data are available for ibandronate. If a drug holiday is advised, reassessment of risk should occur sooner for drugs with lower skeletal affinity. Compston and Bilezikian suggest reassessment after one year for risedronate, one to two years for alendronate, and two to three years for zoledronic acid.9 A "holiday" implies that treatment will be restarted after some time off. Restarting therapy should also include nonbisphosphonate treatment options such as raloxifene, denosumab, and teriparatide. Reevaluate your patients' risk of fracture each year. If a patient has had a good response to therapy and is no longer at high risk for fracture, discontinuing therapy may be reasonable. If she has been on bisphosphonate therapy for 10 or more years, a drug holiday followed by nonbisphosphonate therapy may be the most reasonable approach for high-risk individuals. While the antifracture efficacy and relative safety of bisphosphonates have been well established, concerns have emerged that prolonged use of these drugs might increase the risk of rare but serious adverse events. 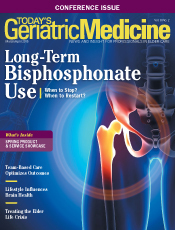 With widespread use, postmarketing reports based upon millions of patient years and long-term use (longer than five years) have suggested associations between some previously unknown, rare adverse events and bisphosphonate use. But no clear cause-and-effect relationship for adverse events including ONJ, AFFs, atrial fibrillation, and esophageal cancer has been established. At the present time, the safety of long-term use has not changed the benefit/risk equation in the treatment of high-risk patients. The benefits of lowering the incidence of typical osteoporotic fractures outweigh the risks of serious adverse events. All bisphosphonate therapies carry warnings or contraindications. You should read the product information to ensure you are current with the latest edition. There has been considerable discussion about how long to treat with bisphosphonates. Fracture risk assessments should be conducted regularly to determine whether treatment could be stopped or whether it should be reinitiated. The duration of treatment and possible discontinuation of treatment should be personalized for individual patients based on their response to treatment (BMD with treatment), fracture risk, and comorbidities. Remember, continued therapy does not mean bisphosphonates are the only option. Consider sequential therapy with other nonbisphosphonate agents as well. In addition, the management of osteoporosis should include multiple fronts. Prevention of falls is tantamount since more than 90% of hip fractures in older adults are the result of a fall. Although the risk of AFF and ONJ is higher with bisphosphonate use, it is extremely small. The benefits of using bisphosphonate drugs in preventing fractures associated with osteoporosis outweigh the risk of an AFF or ONJ. Data for men are lacking; however, there are no reasons to suggest a different therapeutic strategy in male osteoporosis. Firm recommendations regarding the criteria and timing of treatment reinitiation must await further research and investigations based on prospective randomized studies for both men and women. Although this article focuses on long-term treatment of osteoporosis, the fact is that many older people at high risk of fracture receive no treatment, and even when prescribed, patients' nonadherence with drug therapy is widespread. The beliefs and misunderstandings about osteoporosis can be quite varied. The challenge is to be informative, assess your patients' risk of fracture on a regular basis, and do not overlook patients who have had a fracture. — Diane L. Schneider, MD, MSc, is a geriatrician and epidemiologist, a former associate professor of medicine, author of The Complete Book of Bone Health, and cofounder of 4BoneHealth. 1. Black DM, Schwartz AV, Ensrud KE, et al. Effects of continuing or stopping alendronate after 5 years of treatment: the Fracture Intervention Trial Long-Term Extension (FLEX): a randomized trial. JAMA. 2006;296(24):2927-2938. 2. Schwartz AV, Bauer DC, Cummings SR, et al. Efficacy of continued alendronate for fractures in women with and without prevalent vertebral fracture: the FLEX trial. J Bone Miner Res. 2010;25(5):976-982. 3. Rodan G, Reszka A, Golub E, Rizzoli R. Bone safety of long-term bisphosphonate treatment. Curr Med Res Opin. 2004;20(8):1291-1300. 4. Black DM, Reid IR, Boonen S, et al. The effect of 3 versus 6 years of zoledronic acid treatment of osteoporosis: a randomized extension to the HORIZON-Pivotal Fracture Trial (PFT). J Bone Miner Res. 2012;27(2):243-254. 5. Black DM, Reid IR, Cauley JA, et al. The effect of 6 versus 9 years of zoledronic acid treatment in osteoporosis: a randomized second extension to the HORIZON-Pivotal Fracture Trial (PFT) [published online December 26, 2014]. J Bone Miner Res. doi: 10.1002/jbmr.2442. 6. Eastell R, Hannon RA, Wenderoth D, et al. Effect of stopping risedronate after long-term treatment on bone turnover. J Clin Endocrinol Metab. 2011;96(11):3367-3373. 7. Bauer DC, Schwartz A, Palermo L, et al. Fracture prediction after discontinuation of 4 to 5 years of alendronate therapy: the FLEX study. JAMA Intern Med. 2014;174(7):1126-1134. 8. Leslie WD, Lix LM, Johansson H, et al. Does osteoporosis therapy invalidate FRAX for fracture prediction? J Bone Miner Res. 2012;27(6):1243-1251. 9. Compston JE, Bilezikian JP. Bisphosphonate therapy for osteoporosis: the long and short of it. J Bone Miner Res. 2012; 27(2):240-242.